← What the Hell Happened to India? Mooen Ali (left) and Hashim Amla. Bearded wonders. The more observant baseball fans among you will know that a lot of store is put in hairiness or the lack of it. The Yankees are notoriously clean shaven; their perennial rivals the Boston Red Sox, by contrast, are riotously hirsute. Brian Wilson, former San Francisco Giant and now Los Angeles Dodger, has a beard as black and thick as Sherwood Forest. All in all, one would be hard-pressed to find a hairier group of sportsmen than professional baseball players. But wait! 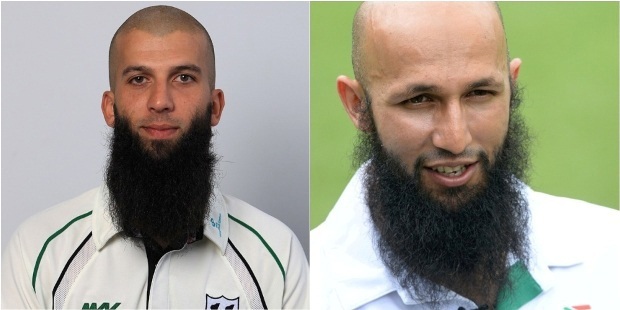 We at Right Off the Bat have been deeply impressed by the follicular thatch of the two cricketers pictured—Mooen Ali of England on the left and Hashim Amla of South Africa on the right. It may perhaps be unnecessary to point out that, unlike the bearded wonders of baseball, what these two cricketers wear on their chins is a sign of their piety. They likewise do not drink (Amla refuses to wear the sponsorship logo of Castle beer on his shirt) and are eager to be models for the Muslim communities in their respective countries. It may only be a coincidence that they are stylish batsmen, with a delicate, almost feline presence at the wicket, but their attempts to break down prejudice about their faith and present an image of the new England and new South Africa are to be applauded. 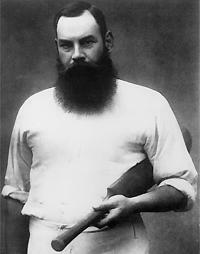 Of course, in their commitment to cricket and hairiness, Amla and Ali have a famous forebear: the magnificently matted W. G. Grace (left). Grace’s girth and bristling temper were matched only by his intimidating bristles—a combination that left bowlers and other teams reeling. We don’t imagine that either Amla or Ali would be interested in competing with Grace in the whiskers department; although they might hope to have his oversized impact on the game. This entry was posted in Baseball, Cricket, England, South Africa and tagged Brian Wilson, Hashim Amla, Los Angeles Dodgers, Mooen Ali, San Francisco Giants, W. G. Grace. Bookmark the permalink.